Also sometimes known by the name the Gion Shrine, the Yasaka Shrine is perhaps the best known shrine in the city of Kyoto. It was originally founded more than 1350 years ago, and has a central location between the Higashiyama District and the famous Gion District which is a tourist hot spot. The Yasaka Shrine is one of the most commonly visited tourist attractions in the city, with many people stopping off here as they walk between these two main areas. The main hall of the shrine combines the inner sanctuary (or honden) and the offering hall (or haiden) in one building. To its front is a dance stage which is lit during the evenings with hundreds of beautiful lanterns, with each one having been donated by a local company and bearing its name. 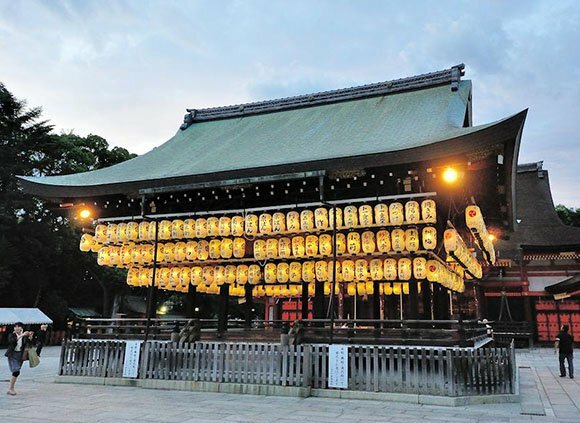 One of the most popular events to be held at the Yasaka Shrine is the Gion Matsuri, or summer festival, which is held every year in July. Perhaps the best known festival in the entire country, the tradition of the Gion Matsuri goes back for more than a thousand years and incorporates a procession of hundreds of people and enormous floats. The Yasaka Shrine is also visited by countless tourists during April when it is cherry blossom season.